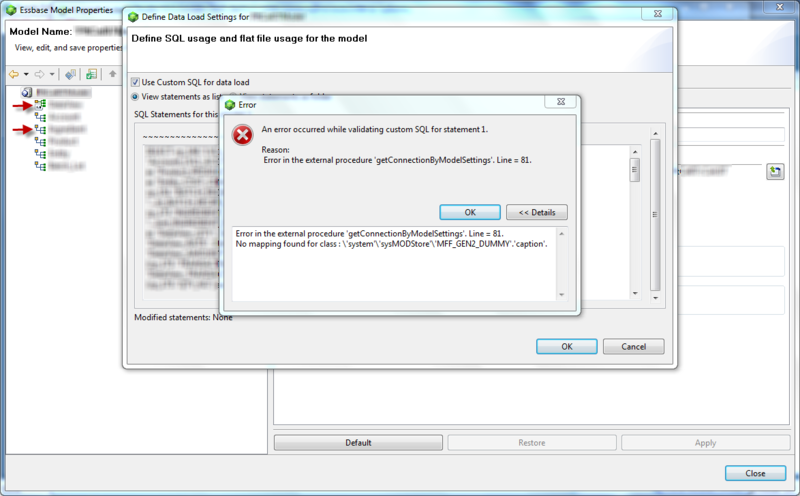 Maybe you’ve seen this error while updating custom SQLs of an Essbase Studio Model. Error in the external procedure ‘getConnectionByModelSettings’. Line = 81. No mapping found for class : ‘system”sysMODStore”MFF_GEN2_DUMMY’.’caption’. We (a colleague of mine, Ashok Shikhare and me)were getting this error when we tried to update the custom SQL of an existing Essbase model in Studio. We tried to search for MFF_GEN2 to see if that is a reserved word and hit nothing!!!!! after lot of search and re-search we finally came up with this. “The model is corrupted or out-of-sync”. First step was to synchronize the data sources (We didn’t want to believe that the models were corrupt) and again we hit the same error!!!! Everything in the Essbase properties looked fine, except for the outline order. Measures (Accounts) dimension was coming first and then it was followed by a sparse member, then followed by dense member!!!! We then arranged it to follow the hour glass model (oh yes that name pops-up anytime and all the time) and voila!!!!! So we did a synchronization of Cube Schema and to our surprise the outline order was changed again!!!! I couldn’t find a reason why it is changing the order, maybe because our model had a sparse dimension called “Account” and it was always pushing that dimension just after “Measures” dimension. Not sure whether this is a common behavior in 11.1.2.2. So if you came across this error, check for the outline order.